So the scotch tasting was... very low level. I actually knew the most about whisky among the people there so I held court a little bit. However, I had Caol Ila 12 for the first time (it might be my favorite now) and after we went through the whisky flights, the host brought out a bottle of Ballechin single malt 10. It was incredibly complex. I'm not even sure if I liked it, exactly but it had so many flavors I had a hard time processing it. I would very much like more just to try and process it. Oh and in case it sounds like I was negative on the tasting, the host was incredible, the food was incredible, I had an amazing time. This one? Agreed! It's amazing. So Ima stick with the good gentleman's Rye. The Constitution was not written and debated in the salons with the aid of Scotch. I'm on a High West kick lately, they have some mid-range ryes ($30-$50 or so in MD) that are very tasty and build a wonderful cocktail. High West is one of the rare points of local cultural pride for me (our brewing scene, our blossoming distilling scene, our independently owned cinema pub, the taco carts about the closed Sears, our Ska scene, and the pastrami burger), so it always makes me happy to see it get cred from elsewhere. I think their entire line is good, but Midwinter is my fave followed by Campfire (I like smokey scotches). They also have some pretty great glassware, pictured here with my Infinity Bottle (and yes, such an item is an ideal, not a branded product. I specifically requested a decanter that was "simple, unadorned, and not tacky" for that purpose). Found a really weird, 1920's style bottled cocktail from Dogfish Head. It smells divine (I'll try it later today). Whiskey, rum and apple brandy with honey, lemon and pomegranate juice. It's called "Sonic Archaeology". I think it's going to be awesome! Also picked up "Rock and Rum" from Lyon Distillery in Maryland's Eastern Shore. Like a Manhattan, with Cherry and other sweet flavors, and some spices, but on a base of rum instead of rye. Again, smells good. Not quite the "omg gotta try this" nose of the Sonic, but still, looking like it'll be a fun evening. Edit - A quick Google shows the first is based on a well-known 19th century Punch recipe. Old cocktails are a vice of mine, so... Yeah! Well, the Rock and Rum is delightful, a warm, rich, spicy version of Rock and Rye that's less bitter, more sweet (Paleocon referred to is as "medicinal", but I found it more like a whiskey-based sweet liqueur; not as sweet as Drambuie, for example) and has a bit of a burn. But you can tell it's not rye based; the rum is much more mellow. Thumbs up. The Dogfish Head Sonic Archaeology is, for me, a must-have. It's like a bells-and-whistles Whiskey Sour, very much what a good old-fashioned Punch should be. Tons of fruit and spice and sugar flavors, but the spirits blend so smoothly that it drinks like a Long Island Iced Tea. Easy on the tongue, sour and sweet, I'd put this in iced tea and fill the glass with ice on a hot day. Very easy drinking, pretty potent, and unlike the Rock and Rum, very light on the tongue. Find this and grab it if you are into Whiskey Sour style drinks. (It's balanced for melting ice, so if you serve it neat, add a splash of water for every 2 ounces or so to reel in the sour). I feel like I hit the jackpot with both of these. I'm finishing a tot of the R&R with some dark chocolate, and it's a luscious pairing. I just found a bottle of this (along with a bottle of Blanton's bourbon that has long eluded me) at a store right around the corner from my office. I quite liked the Caol Ila. It's not my favorite, but I will almost certainly buy it again sometime. Happy birthday to me. 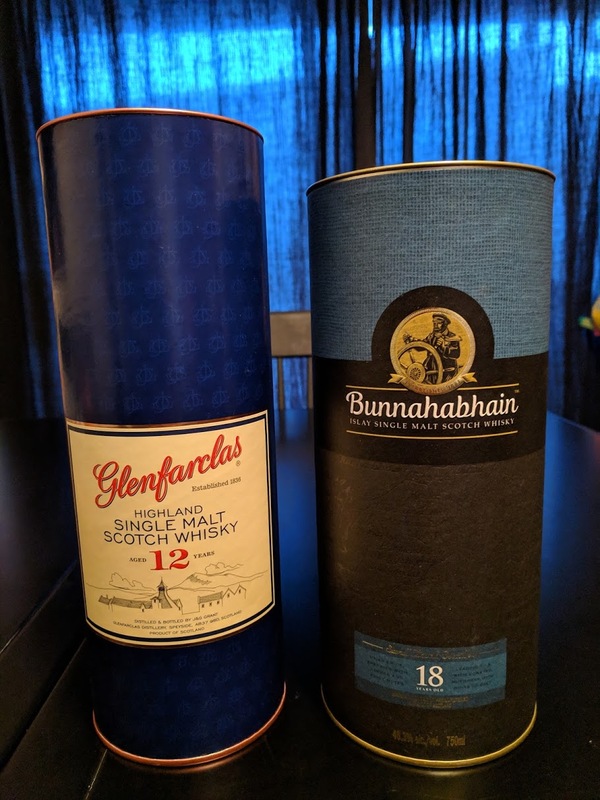 I had a shot of the Bunnahabhain a couple years ago, and this is only the second bottle I've ever seen on sale. My fiancee convinced me to get it as my birthday gift, and it'll be great to taste it again. My friend really loves the Glenfarclas, and we've been having trouble finding it, too. I recommend the Arturo Fuente with Blanton's Special Reserve pairing. 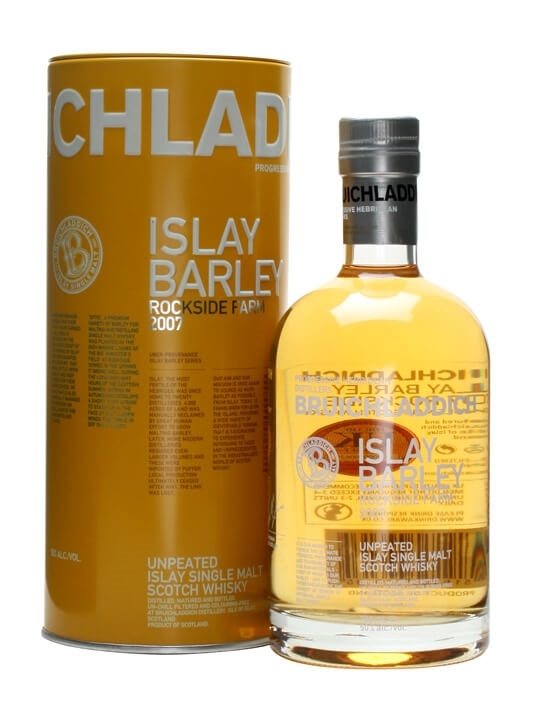 I stopped by the store near my office on the way home, looking for something new, and picked up a bottle of Bruichladdich Islay Barley Rockside Farm 2007. I've had one glass so far, and really like it. It's unpeated, but still a very tasty Islay. A gift from my dad to celebrate my new job. Maker's with a bow on top. Good times will be had. Pic seems borked to me. Side note, sipping some Old Forester 100 right now. I've learned why people love Tennessee whiskey! You can put enough ice in it so you can't taste it. I saw it before on my PC, but can't see it now on my phone. That is my new go to and i was sipping it last night as well. Skip the 86 completely. The OF100 is so much better. It has become one of my favorites and will be in permanent rotation in the collection. The 100 is great. It’s a ludicrously good value. Yep i was shocked it was only $23. Super stuff. He said it was incredibly tasty! Quite jealous you can get scotch from Amazon in the UK!